Israeli soldiers shot and killed at least 41 Palestinians during mass protests along the Gaza border on Monday. It was the deadliest day there since a devastating 2014 cross-border war and cast a pall over Israel’s festive inauguration of the new U.S. Embassy in contested Jerusalem. By midafternoon, at least 41 Palestinians, including five minors, were killed, the Gaza Health Ministry said. One of the minors was identified as a girl. 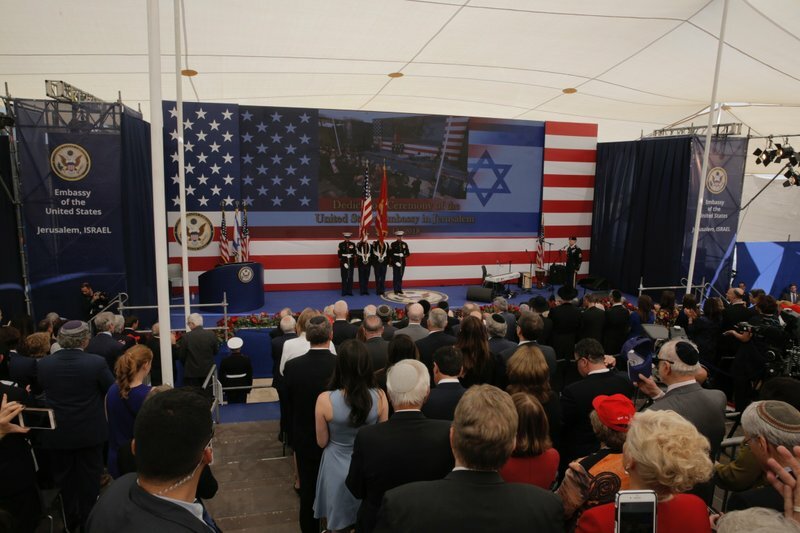 At the same time, just 70 kilometers (45 miles) away in Jerusalem, the opening ceremony of the embassy got under way. U.S. Ambassador David Friedman welcomed the crowd. Jared Kushner and his wife Ivanka Trump, both top aides to President Donald Trump, led a high-powered American delegation that also included the treasury secretary and four Republican senators. “A great day for Israel!” Trump tweeted Monday. The protests mark the culmination of a campaign, led by Hamas and fueled by despair among Gaza’s 2 million people, to break the blockade of the territory imposed by Israel and Egypt after Hamas seized control of Gaza in 2007. Since weekly border marches began in late March, 83 Palestinian protesters have been killed and more than 2,500 wounded by Israeli army fire. Hamas said four members, including three security men, were among the dead Monday. “Moving the U.S. Embassy to Jerusalem will be a disaster on the American administration and a black day in the history of the American people because they are partners with the occupation and its aggression against the Palestinian people,” he added. Hamas leaders have suggested a border breach is possible Monday, something Israel has vowed to prevent at any cost. Lt. Col. Jonathan Conricus, an Israeli military spokesman, said the army had set up additional “layers” of security in and around communities near the border to defend Israeli civilians. He said there already had been several “significant attempts” to break through the fence. But it also marks the anniversary of what Palestinians call their “nakba,” or catastrophe, a reference to the uprooting of hundreds of thousands who fled or were expelled from present-day Israel during the 1948 war surrounding Israel’s creation. Clouds of black smoke from burning tires rose into the air. Earlier Monday, Israeli drones dropping incendiary material had pre-emptively set ablaze some of the tires collected by activists. Trump’s decision to move the American embassy from Tel Aviv to Jerusalem was welcomed by Israel and condemned by the Palestinians. In the West Bank, several dozen Palestinian stone-throwers clashed with Israeli troops on the outskirts of Jerusalem, with no immediate reports of injuries. Earlier Monday, several thousand gathered in the West Bank city of Ramallah to protest the inauguration of the new embassy. Palestinians seek east Jerusalem as a capital and view the Trump administration’s change in policy as a blatant show of pro-Israel bias. Israeli Prime Minister Benjamin Netanyahu has repeatedly praised Trump’s decision to upend decades of U.S. policy by recognizing Jerusalem as Israel’s capital. European foreign ministers said Monday the embassy move was unwise and likely to exacerbate tensions. Their comments come after the Czech Republic, Hungary and Romania blocked the full 28-nation European Union from publishing a statement about the U.S. move.